The Reeder iPhone App lets you pull up to see the title of the next article. If you pull up far enough the arrow rotates and the next article animates into view. We want to recreate this UI. If you don’t pull up far enough, the article bounces back into view and that is a very strong clue that we are dealing with a UIScrollView. A UIScrollView is used to display content that is larger than the application’s window. You tell it the contentSize of your content and it manages scrolling within the content. When you get to the edge of the content, the scroll view bounces to let you know you’ve reached the edge. Normally when you pull up at the edge of a scroll view empty space appears, but in the Reeder app, the title of the next article appears along with an arrow. To recreate this we’ll create a scroll view with a contentSize that is the same as the scroll view. Then we’ll tell the scroll view to alwaysBounceVertical. This causes a view that bounces vertically when you pull up or down. Next we’ll add a header view as the subview of the scroll view and set it’s frame to be right above the scroll view and we’ll add a footer view as the subview of the scroll view and set it’s frame to be right below the scroll view. The header and footer are offscreen but when you pull up or down, they get pulled into view. In addition to trying to figure out how to recreate the feature, we need to also figure out how to structure our code. The most reusable part of this feature is the ability to swipe up and down to see another article while seeing a preview of the previous/next article. We’ve already determined that we’ll be using a scroll view that we’ve customized so it seems logical that we would create a subclass of UIScrollView. The arrows in the header and footer rotate to let the user know that when they lift their finger, the previous/next article will be shown. When the view has been scrolled past some distance we need to trigger this arrow rotation. To accomplish this we will listen to the UIScrollViewDelegate’s scrollViewDidScroll message and check the scroll view’s contentOffset. This means that our UIScrollView subclass will have itself as its delegate. This sounds odd but works just fine. The UIScrollViewDelegate’s scrollViewDidEndDragging message lets us know when the user has lifted their finger after dragging. To animate the next page, we place the page below the footer and inside of an animation block place it on screen. This results in a nice up animation. We also register a callback for when this animation is done and make sure our header and footer are in place for the next time the user pulls the scroll view up or down. Our UIScrollView subclass calls the delegate’s viewForScrollView:atPage to get the actual pages. Life would be simple if we could return a static page like say an image, but in the real world it is more likely that you will be returning a UIWebView to accommodate things like titles that may wrap. The sample app uses a JSON feed of the top paid apps in the App Store and uses a UIWebView to display each page. No matter how simple the html that you are displaying in a UIWebView, the rendering will not be instantaneous and there will always be an overhead of setting up the UIWebView. 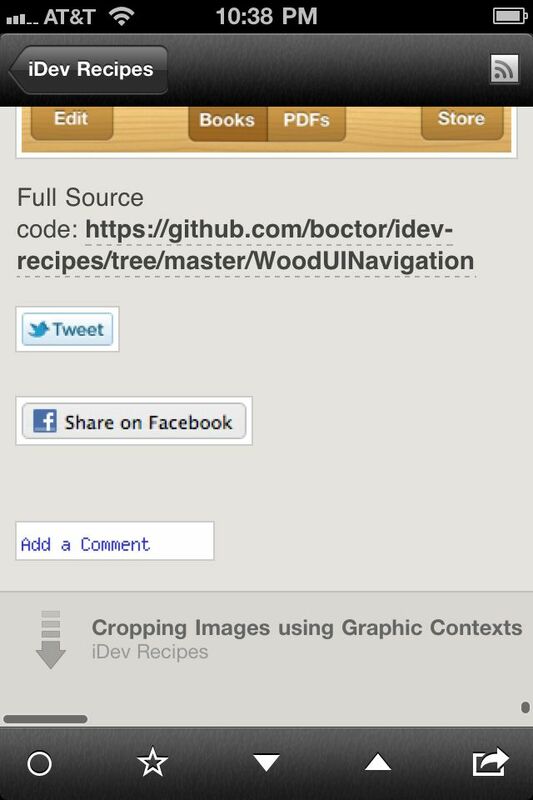 If every time viewForScrollView:atPage is called you created a new UIWebView with html, then as this page is getting animated into view, the rendering will not have completed. The net result will be that the scroll animation will show a blank white page instead of the actual content. To deal with this the sample app keeps around a previousPage and nextPage UIWebViews. When asked for page 1, the sample preloads previousPage with page 0 and nextPage with page 2. If there are other caching techniques you think would work here, please share your thoughts in the comments.